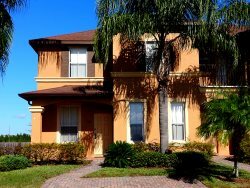 This beautifully furnished and recently upgraded home is in a popular gated community located close to Disney and all of the Orlando Area attractions. The home is spacious and open with a sparkling private pool that has hedges to give complete privacy from your neighbors while you are relaxing. This community also has the benefit of a Club house with gym, playground, tennis courts and games room.